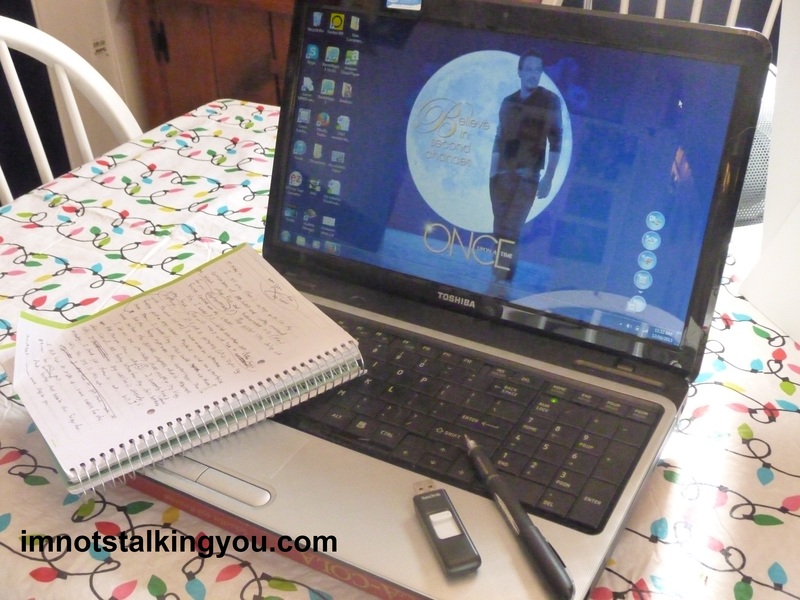 determination | I'm not stalking you. 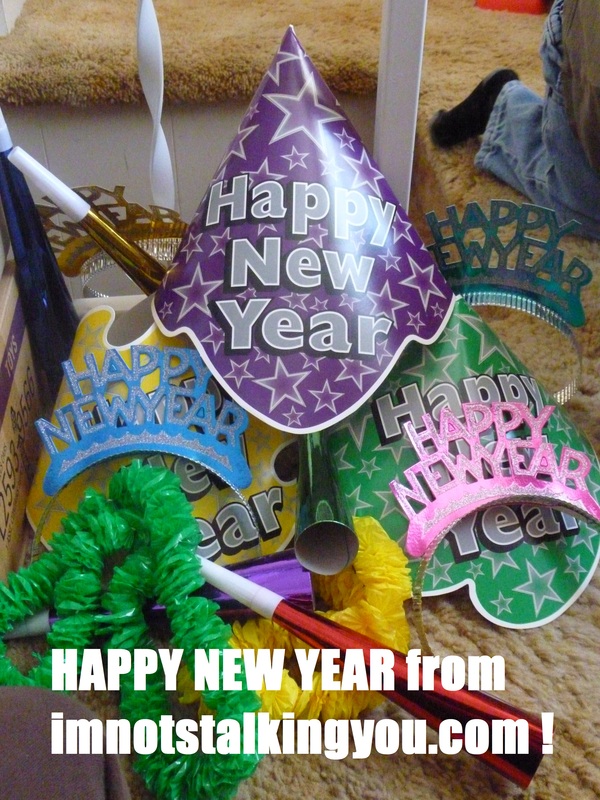 I did not achieve my goal for 2013. I blame part of that on the fact that I didn’t make my goal/resolution until, like, April. I could also say I was busy with my job. Or chasing around my 3 year old son. Really, I just didn’t have the drive to follow through and get it completed. But I did complete other aspects that are still moving in the same direction as my goal. I have not lost hope. I just think my original goal may have been too–ambitious. Maybe another 6 months and I could achieve it. Afterall, it has taken me 4 days to publish this post. Posted in A day in the life and tagged ambition, Day, determination, goal, lack of, maybe next year, maybe this year, New Year, procrastiantion, resolution, will power, writing. Bookmark the permalink. My asbestos friend always laughs at me because I bought a house with a fenced in backyard, yet we at my house wage a constant battle to keep our two dogs in the yard. We got Dave in 2004. I think the first time she escaped was during the first week we had her. I left both the front and back doors to the garage open. Whoops. E. The back door is within the fence, the front is not. So she just walked right on through, and sniffed her way three houses down. I caught up to Dave just at the same moment a lady popped out her back door and gave me a funny look. “Just getting my dog,” I explained. Apparently that lady is still mad about that, as she brought it up to my sister-in-law last summer: eight years later! The next time, my husband left one of our three gates open. It was garbage night, so Dave wandered across the street to sniff the neighbor’s garbage. My husband had to chase her in his socks. Luckily, in both these early Dave incidents, she had her nose to the ground and was traveling at a pace very conducive to recovery. Dave was great until…she would see the dog next door outside. Over the fence she would go. Or a dog passing by on the sidewalk. Or two. Or three. (We live in the city, on a very busy corner.) A four foot high chain-link fence, a 60lb dog. But she would just scale it in no time. We had to start putting her on a lead when she was outside unsupervised. We learned real quick that the collars with the plastic, snap-together closure are not meant for tie-outs. Also, we learned to change the tie-outs annually, before they could break on their own. Both of these incidents ended with Dave in the neighbor’s yard. Once they put their dog back in the house, she would stand there like “Wait, how do I get back into MY yard now?” Apparently, climbing a fence requires the appropriate motivation. I contemplated buying some of that fence topping stuff they use on high school baseball fields. You know, it looks like plastic drainage pipe for a field? (Sorry. Maybe you only know that if you live in rural Michigan.) I went as far as going to a lumberyard to price it, but the salesman pretty much laughed at me and discouraged me. I think it would have worked too, because it would have been too wide for Dave to wrap her legs around and get a grip. But, in the end, old age seems to have been the best deterrent for that behavior. 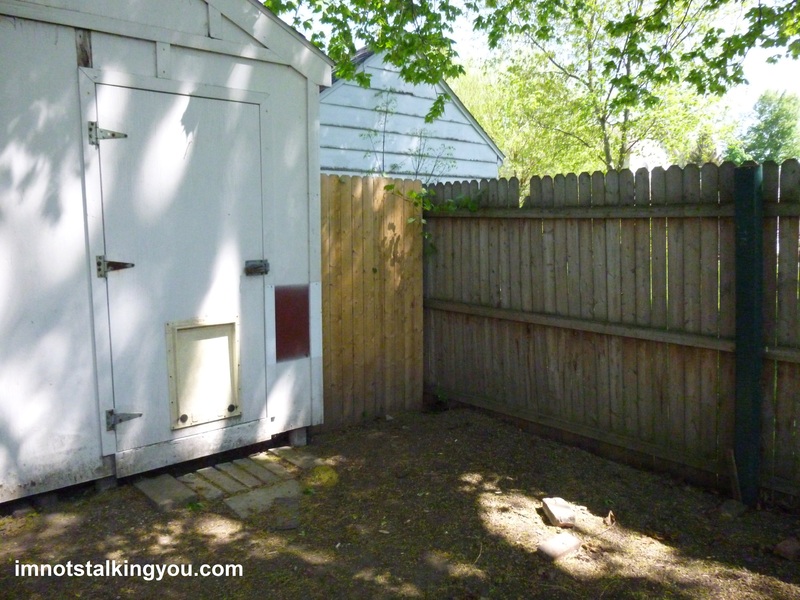 Now, when we moved in, our backyard was fenced in, as I mentioned earlier in this post. But the back door was not. The previous owners added on a laundry room past the back door, which I am forever grateful for. But this made the backyard gate NEXT to the backdoor, instead of within it. It wasn’t a problem with Dave. She would just run around the corner to the backyard, no problem. 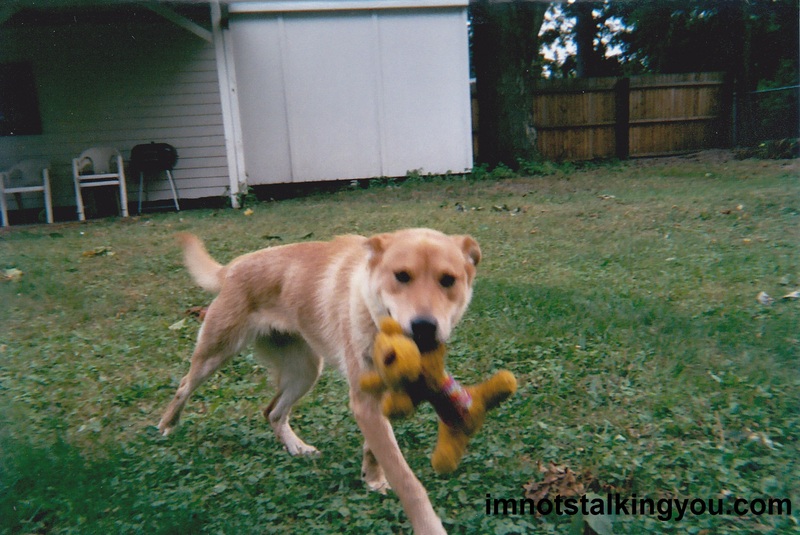 Parker, we would hold on to his collar as he went around into the yard. 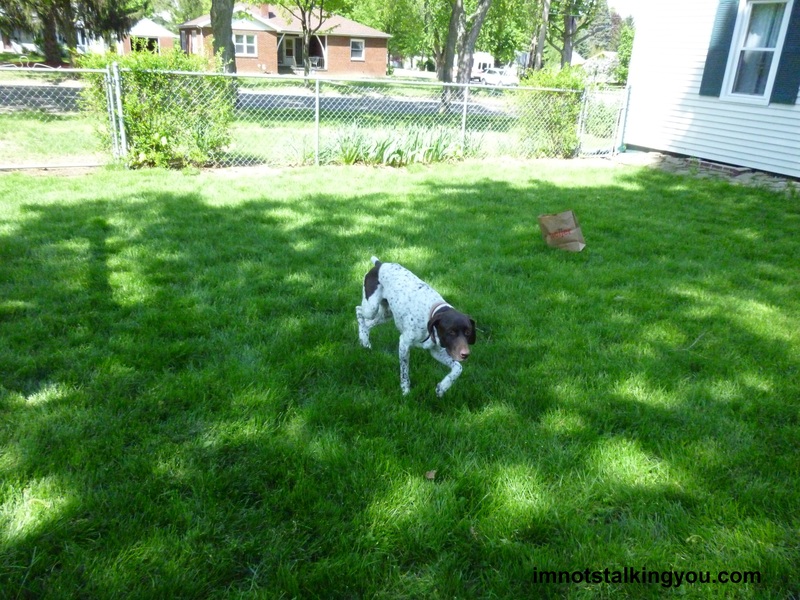 Parker is a German Shorthaired Pointer and a real flight risk. Sometimes the gate still got left open and the dogs escaped. If Parker got past the five nearest houses, it was impossible to catch him. Usually we had to wait for him to quit running, and stop at someone’s house. (I am sure he was looking for a couch to lay on.) The good samaritan would call us, and we would go pick him up. One time some high school kids found him and brought him back to our house. It was a cold, freezing rain night (that is when he chooses to run away 95% of the time). He was curled up in the backseat of their warm car and didn’t want to get out and go in the house. I could have strangled him. One time a couple brought him back, and he smelled like the woman’s perfume. He must have rubbed himself ALL OVER that poor woman to smell that strongly. The only time we ever found Parker on our own once he left the immediate vicinity, he was running down the sidewalk. We followed him in the car. We clocked him doing 18mph. As my husband said, that was just “cruising speed”. One hot, summer day (part of the other 5%), Parker decided to take a dip in a nearby lake. Talk about a bad wet dog smell! So, I was finally fed up. I measured and called to see how much it would be to get fence and another gate for the back door. I think it was about $350. I made sure I got a wide gate so that our back door could still be wheelchair accessible for my (other) sister-in-law. The newest part of the fence, enclosing the backdoor. See old fence restricting a toddler in the background. Best damn $350 I ever spent. Totally worth it when the fence guy was backing out of the driveway and I let the dogs out. The concrete for the fence posts wasn’t even set yet. They ran into the backyard as usual. Parker peed, then ran at FULL SPEED up through the former gate (that was sitting open) and jumped on the new fence like “NOOOOOOOOOOO! What IS this thing blocking me!” I laughed so hard. He was even whimpering. It was great! But, alas, Parker still found ways out. There was a small space next to the garage, a few feet wide. Parker would try to go there, so we would block it with a pallet. He would get past the pallet, to the old, rotten fence. He got past that. We put in a new section of fence, where the pallet used to be. Parker figured out he could crawl UNDER the back of the garage and escape beyond the fenced area. We had to block that “crawl space” with the leftover fence from the other barricade. Where the house met the chain-link fence, there was a tiny gap. You wouldn’t think a 60lb Pointer could get his rib cage through there, but he did. 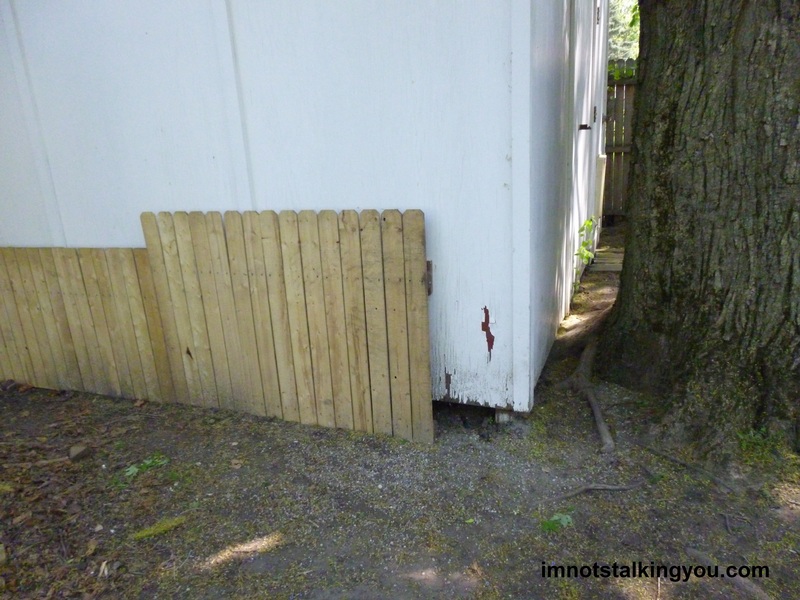 There was another such gap where the chain-link and the wooden privacy fence came together. 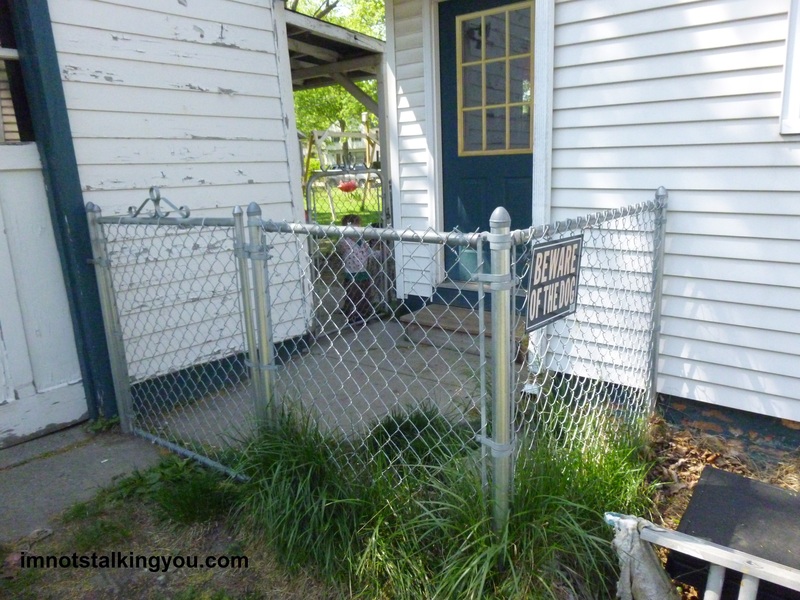 [Have you ever heard of a yard with SO MANY FENCES having so MANY dog escapes?] We put metal posts in both locations to block further escapes. 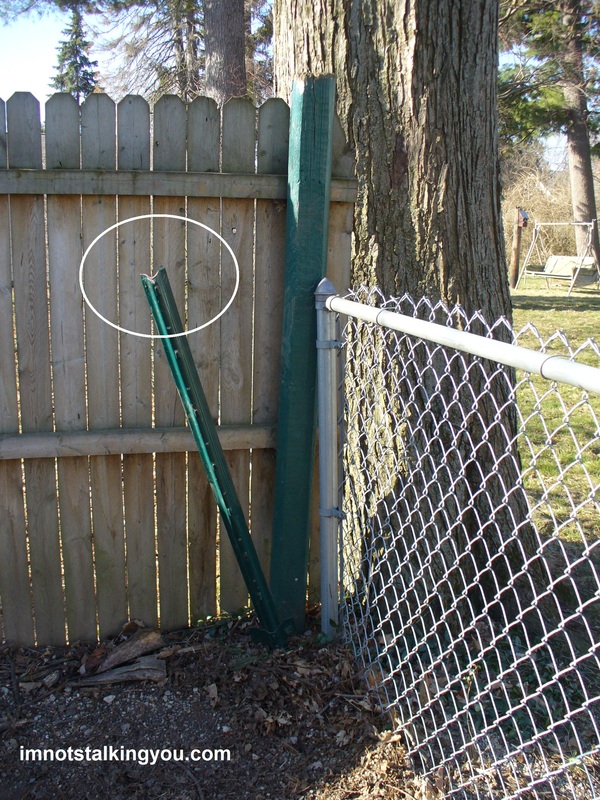 The posts worked well until April 2, 2013, when Parker tried to impale himself on one [click here for more details]. Now, we are mostly fortified. I think. Except there is still some open space under the garage. And the place where it looks like a dog head-butted the wooden fenced and warped the wood. 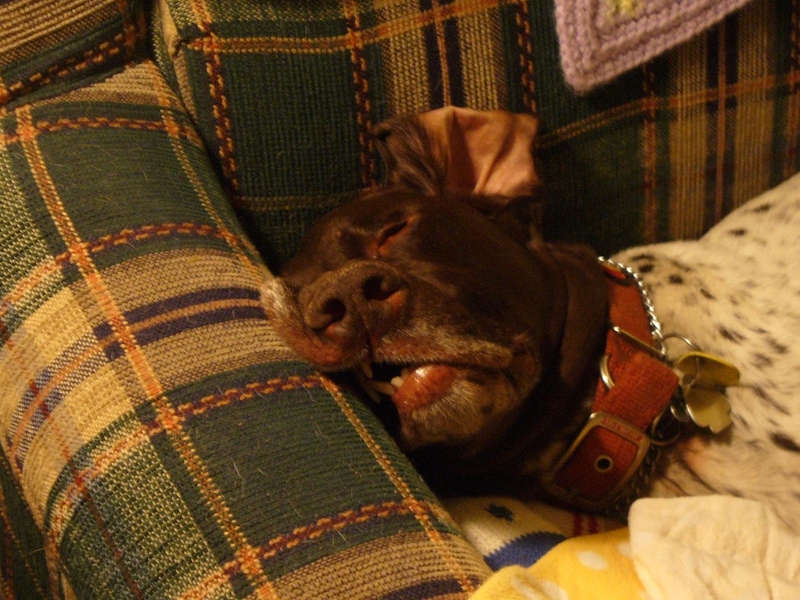 One day, I saw a Pointer run past my living room picture window and down the street. My heart instantly started to race. Then I checked the couch. Posted in A day in the life and tagged backyard, collar, Dave, determination, dog, escape, fence, frustration, German Shorthair Pointer, Lab-Chow mix, lead, Parker, runaway. Bookmark the permalink.